It always happens in July... I start getting the Christmas itch. I am dreaming of trees, and garland and twinkle lights. 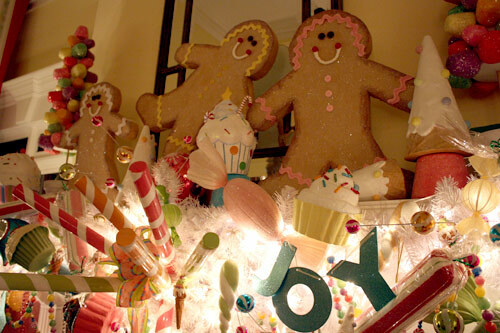 Last Christmas I didn't use all my decorations, because I wanted to make things easier on myself. That was a dumb idea! I regretted it. I am planning on going all out this year. I am going to put the Griswald's to shame! I loved the Romantic Homes Magazine I got in December. 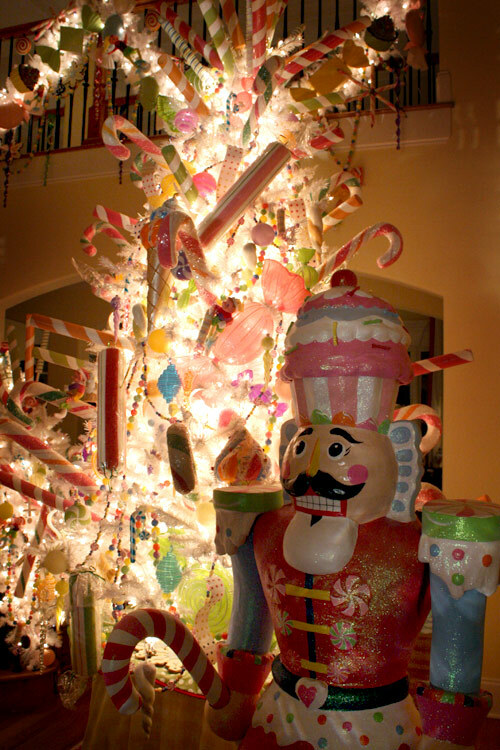 They did a fun article called Candyland Christmas. I can't find it online anywhere and the homeowner doesn't have a blog! BUT, she's friends with Bakerella! And Bakerella posted some pics of this beautiful house in 2009. Right up my Christmas alley! At least she is trying to clean herself up! I heard, "uh oh" and "oh, a mess!" several times from the back seat tonight! Nothing a package of baby wipes can't fix! I saw Santa yesterday at a Cajun resturant in Kingwood, Texas. He was wearing a red shirt, matching red bermuda shorts and red bowling shoes. I asked him what he was doing and he said "eating lunch" and "checking his list!" Oh I am getting itch too. Usually starts in August. I have sworn for years that I'd listen to the urge and start small when it hit. I know I'd look crazy with a Christmas tree up in August. But we put up 5 trees so it would certainly help! Now there's a girl who knows how to enjoy ice cream !